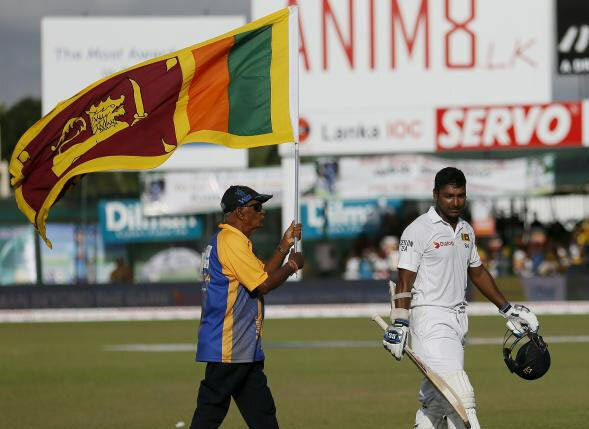 There was no fairytale farewell but Kumar Sangakkara left behind a slew of batting records and a rich legacy after playing his final test knock at the P Sara Oval on Sunday. Indian off-spinner Ravichandran Ashwin cemented his status as Sri Lanka’s current public enemy number one by dismissing the home hero for the fourth time in four innings. Ashwin once again induced an edge which Murali Vijay pouched in gully as Sangakkara, arguably the greatest Sri Lankan batsman, finished his 134-test career with 12,400 runs with a 57-plus average. It puts him fifth in the list of highest test run scorers, while the 14,000-plus runs he scored in 404 one-dayers before quitting the format after this year’s World Cup, places him second in the 50-over list after Sachin Tendulkar. Sangakkara made 32 in the first innings of the second test against India and came out early to bat in the second after Ashwin had dismissed Kaushal Silva in the third over of the innings. As has been the case in the first innings, the 37-year-old walked out to a guard of honour by the Indians and the umpires and the otherwise phlegmatic cricketer betrayed nerves and nearly ran himself out after a misunderstanding with Dimuth Karunaratne. He calmed nerves by unleashing the trademark flick that sent an Ishant Sharma delivery racing to the fence. The famed straight drive also made an appearance but like in the first innings, Ashwin made sure Sangakkara did not convert the start dismissing him for 18 to groans from spectators. The Indians rushed to shake hands with Sangakkara, who took off his helmet and turned back to acknowledge the applause from the crowd. They gave him a standing ovation as he retreated into the dressing room. It was not the ideal exit but Sangakkara left having cemented his place as, at least statistically, the greatest batsman Sri Lanka has ever produced. Sangakkara made his test debut 15 years ago as a shy stumper-batsman against South Africa at Galle, entering a dressing room that contained big names including Arjuna Ranatunga, Sanath Jayasuriya and Muttiah Muralitharan. In Mahela Jayawardene, he soon found a friend. Born five months apart, their partnership on field was often the foundation on which Sri Lanka built their innings. A law student with a silver tongue, Sangakkara could easily get under the opposition’s skin but the 2012 ICC Cricketer of the Year never crossed the line. Like Jayawardene, Sangakkara wanted to quit international cricket soon after the World Cup but was urged to stay on, helping the side under Angelo Mathews as they embarked on a tricky transition. Sangakkara, who has scored 63 innternational centuries, agreed to play four tests, two each against Pakistan and India. His fans desperately wanted him to score one more double century to equal Don Bradman’s record of 12 but that was not to be.